I just watched this movie on DVD the other night – wow was it fantastic. 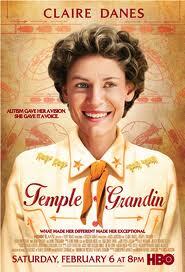 It is a very inspirational biopic of an autistic women who goes to college, gets a master’s degree (eventually a PhD) and uses her gifted mind to revolutionize the cattle industry. Claire Danes acting is amazing, but the story is so amazing that if it was fiction you would not believe it. Highly recommended. My Gal and I just watched this last night on your recommendation. I just about turned it off after the first 5,10 minutes. Claire was rubbing me the wrong way. My Gal told me to hang in for a little longer. Am I ever glad I did. I warmed up fast to Temple (and Claire’s performance). The story really started to smoke for me when as a university student she first went to the stock yard and into that “Mans world”. I really liked how the director played that one out. I bought the whole deal and was totally engaged. A real sleeper for me and will not forget it anytime soon. I love when they cast people that look like they’ve been around livestock. Good one Axl. Thanks.